I purchased a flat of organic strawberries and had to process them before they started to spoil. Strawberry jam is one thing my Mom made every year. We would go pick strawberries as a family, eat them until we could eat no more, make jam and freeze it for use during the year. It was great to wake up to breakfast with this easy to make jam. The great thing about making your own is you can control the amount of sugar that you use – plus it tastes much fresher than the store-bought jams. I used the Ball brand Fruit Pectin. Clean the strawberries and remove the stem and slice the strawberries. Place them in a large bowl, add lemon juice and stir. Mash them with a potato masher (in batches works best). Add the 4 cups of sugar and stir to coat the strawberries. You may want to mash them again as they soften. It is recommended to let them sit for 10 minutes to let the sugar pull the juices out of the berries. 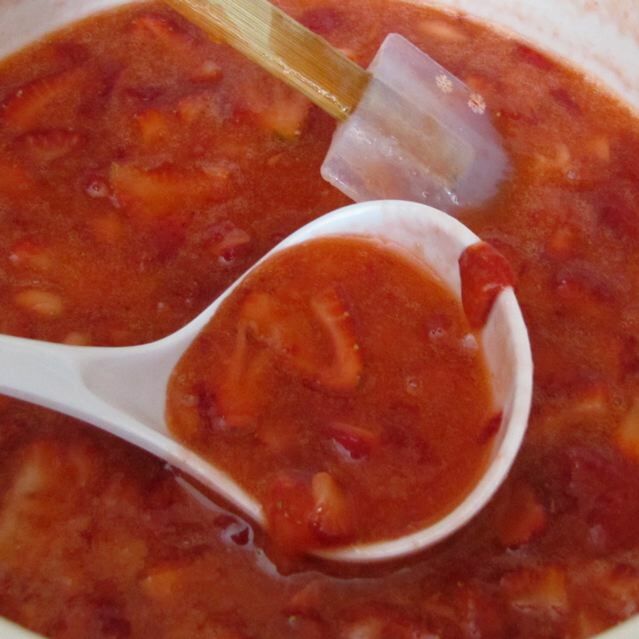 In a small sauce pan combine 3/4 cup water and one package of the fruit pectin. Whisk to combine and heat over high heat until it is at a brisk boil. Boil the pectin whisking constantly for one minute. Stir the gelatin into the bowl of strawberries and stir for 3 minutes. Ladle the strawberry jam into small containers, but be sure to leave about 1/2 inch head room for it to expand when you freeze it. 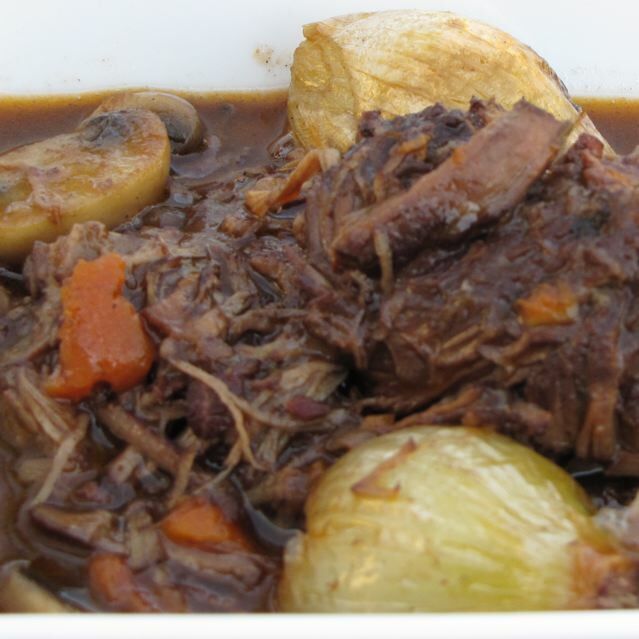 Place in the refrigerator to cool for up to 24 hours (but no more) and then freeze. Use the strawberry jam within a year of freezing it. It will keep in refrigerator for up to 3 weeks. Enjoy. Categories: Fruit, Preserves | Tags: Freezer Jam, Homemade Jam, Strawberry Jam | Permalink. 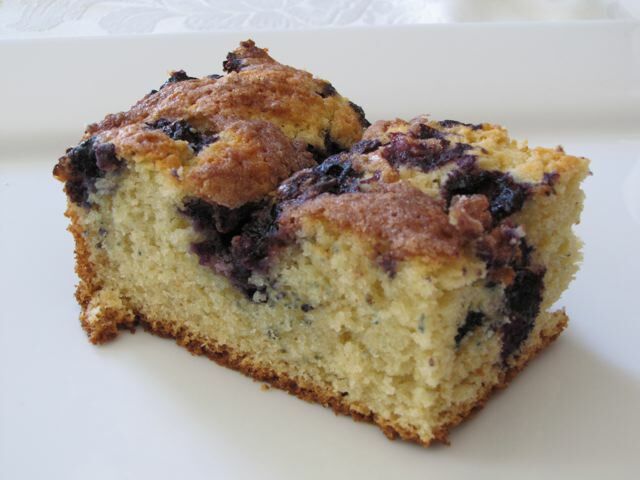 This is a delicious coffee cake that uses blueberries. I love to make it when I have fresh blueberries on hand (but frozen or even canned work with this). I have to warn you though, it is NOT diet food. It used 3/4 of a pound of butter and is rich and creamy with the buttermilk in the mix. It comes from the cookbook: The Black Dog Summer on the Vineyard Cookbook is a wonderful addition to my collection of cookbooks. Preheat oven to 350° F. Spray a 9x13x2 baking dish with cooking spray. Sift the dry cake ingredients together onto a large square of waxed paper, or whisk the dry ingredients together in a large bowl to eliminate clumps. In a mixing bowl, mix together all the wet ingredients (not the blueberries). Add the dry ingredients into the wet and mix until just blended. Spread the batter into the prepared pan and sprinkle with all of the fresh blueberries. In a smaller bowl, mix the dry ingredients for the crumb topping together until combined and cut in the butter (using your hands is the best method for this) Sprinkle the butter topping over the batter (it is okay if it is not completely mixed the butter will melt into the cake and it will still be delicious. Bake for about 50 minutes, or until a knife comes out clean. The cake should be moist, not dry. After cooling, cut into big squares or rectangles. Serve slightly warm with coffee. YUMMY!! I find that this cake only gets better the second day and is especially good warmed up in the microwave (15-20 seconds) and best enjoyed with coffee. Categories: Baking, Breakfast | Tags: Blueberry Cake, Coffee Cake | Permalink. My husband grew up with this sandwich and now it is one of my family’s favorite sandwiches as well. It consists of toast, topped with American Cheese slices, sliced tomato, and cooked bacon which is then broiled for a few minutes until the cheese is melted. We made this while we were vacationing in NJ on the shore and wanted something easy to make that did not take long. Clean up is easy if you use those convenient (all be it expensive) Microwavable bacon. 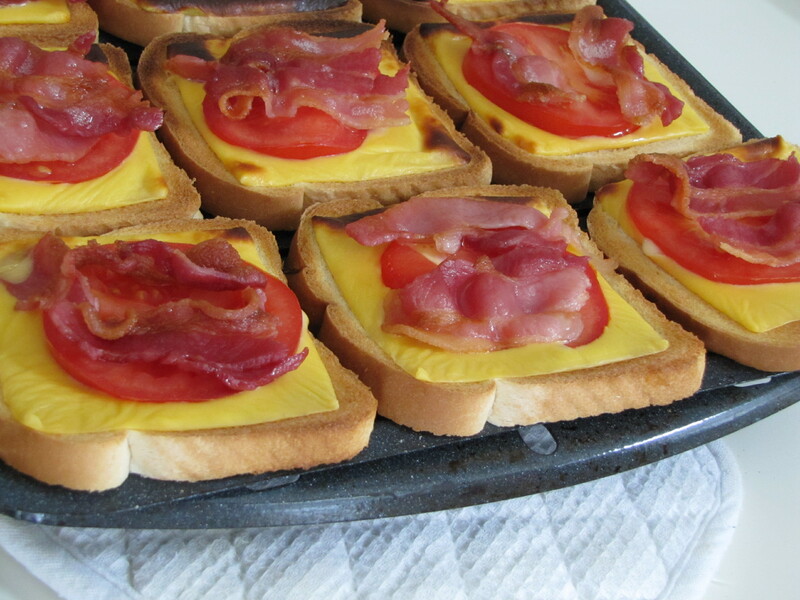 Toast the bread and top with American cheese slices, tomatoes, and bacon. Broil under a watch full eye. Once the cheese melts and bacon bubbles it is ready to eat. Categories: Favorite, Kid's can cook!, Sandwiches | Permalink.